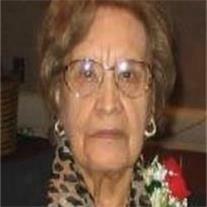 Rita P. Reyes of Phoenix, AZ, passed away peacefully Sunday, June 10, 2012 at the age of 91. She was born May 22, 1921 in Gomes Palacio, Durango, Mexico. Rita and her late husband, Rev. Roman L. Reyes and family lived and ministered in Wyoming, Nebraska, and Colorado before settling in Arizona. Rita is survived by her four daughters, Irma Schmidt, Rosella Escamillo, Ruth Cameron, Norma Shipp and five sons, Reuben, Roger, Roman, Robert and Rudolph Reyes, 36 grandchildren and 56 great grandchildren. Funeral Services are Monday, June 18, 2012 at 10 AM, preceded by a visitation at 9 AM at Bunker’s Garden Chapel, 33 N. Centennial Way in Mesa. Interment to follow at Phoenix Memorial Park, 200 W Beardsley Rd, Phoenix.